Whiskey is stored in oak barrels, where it ferments for years. After the whiskey is fermented, the whiskey is bottled and the oak barrels disposed of. The barrels are often recycled for various uses: trash receptacles, storage bins, and--when cut in half--planters for garden use. Planting in a whiskey barrel adds rustic charm to a garden. Clean the whiskey barrel to remove dirt and loose rust. Whiskey barrels are typically very dirty and may have soot on them. Wear old clothes and gloves when you handle it. Find an area of your yard to place your whiskey barrel. Keep in mind the kinds of plants you are going to plant in it. Succulents and most flowering plants require at least eight hours of direct sunlight per day. Decide if you want the plants upright or on their side. Placing whiskey barrels on their sides and filling with plants creates an illusion of plants spilling out of the planter. To place the planter on its side, dig a shallow hole in the soil to place the side of the barrel in. Pour potting soil into the barrel, and plant seedlings into the soil. Fill the bottom of the barrel with empty cans if you want to place the planter upright. Leave only 8 to 10 inches of space between the top of the cans and the upper edge of the barrel. Whiskey barrel halves have more depth than plants need, and filling the entire planter with potting soil will make the project heavier and more costly than need be. Cover the cans with sheets of plastic or empty plastic garbage bags. Tuck the ends around the pile of cans. Pour potting soil on top of the plastic. Do not tamp the soil down. Use your hands to create small wells in the soil, and plant a seedling plant into each well. Plant the seedlings as close together as possible. 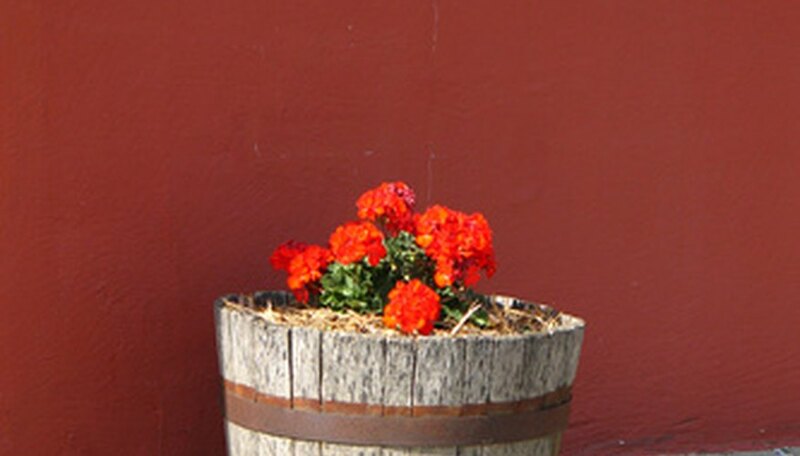 Whiskey barrels are more striking when the plants or flowers are planted tightly.